İstanbul Bilgi University Human Rights Law Research Center organized its third “Human Rights Law Summer School” between 17-25 July 2017 (in Turkish language). The Summer School held in santralistanbul Campus of İstanbul Bilgi University is attended by 27 undergraduate law students from universities of Anadolu, Ankara Yıldırım Beyazıt, Beykent, Çağ, Galatasaray, Gaziantep, Hasan Kalyoncu, İstanbul, İstanbul Aydın, İstanbul Bilgi, Kadir Has, Kocaeli, Koç, Marmara, Okan and Turkish-German. The topics covered in the Human Rights Law Summer School were; human rights law and protection regime; human rights protection system of the United Nations and Council of Europe; fundamental rights and freedoms in the Constitution; right to life; prohibition of torture and inhuman treatment; equality and prohibition of discrimination; women’s rights and violence against women; freedom of expression and Internet freedom; freedom of peaceful assembly, demonstration and association; restorative justice; transitional justice; right to the city; local governments and human rights; business and human rights; labor rights as human rights; rights of the child; and refugee rights. Throughout the program of the Summer School along with lectures provided by the teaching team on these topics, interactive methods such as group-work and discussion sessions were conducted with the aim to develop skills and enhance knowledge of the participants. Besides lectures, students had the opportunity to meet with representatives of civil society organizations and international human rights organizations and people from various professions who conduct human rights advocacy and research targeting different vulnerable groups. In these sessions the focus was on LGBTI rights, rights of the disabled, women’s rights and status of refugee women, and refugee rights. 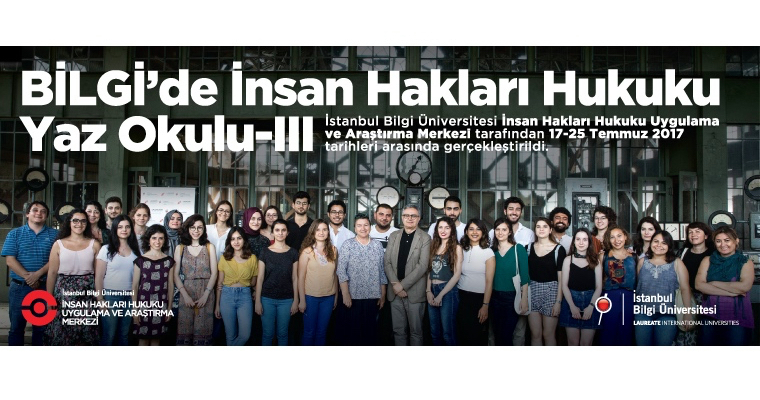 The Summer School that İstanbul Bilgi University Human Rights Law Research Center organizes targets law students who are eager to enhance their knowledge and skills in the field of human rights law.